The parking lot next to my building is being torn up so they moved motorcycle parking. In spite of what the said during the planning process, they are still three spaces. I still opted to use most of one of the spaces. I returned from Barrow on Monday to beautiful, warm weather and I've been running around ever since. 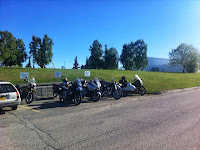 Another Ural rider/blogger, CCjon, came through last night but too many things going on to meet up then. I invited him to coffee this morning but I think he wanted to get an early start up the Dalton Highway to Prudhoe Bay. It would have been nice to meet up, but just didn't have time last night. Tonight, Bridget and I begin our adventure when we head off on our first international trip together. (Driving through Canada or cruising to Ensenada doesn't really count) We initially head to Portland, OR, for a day then we are off to Japan then on to Singapore. Should be interesting. I'll post pictures when I can. Safe flight and looking forward to the pictures! Have a good trip. I am waiting for photos too. Wishing you a safe and fun filled adventure! Have fun. It will really be an adventure to go overseas. Me thinks the weather will be really toasty too. Oh! Have fun! Sounds like an interesting adventure! Have a fantastic trip Richard. The amphibious craft trip down the river in Singapore and a trip to the Night Zoo are absolute musts! Thank you all for your well wishes. I plan to take a lot of pictures but then again, I always say that. We will be traveling with my mom and my sister and her family and when in Singapore, staying at their apartment. Thank you for the suggestions. I think both were on the list of things my sister had sent earlier. I had heard about the night zoo but not the boat excursion.